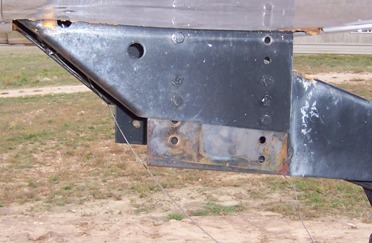 The exercise of flipping RV axles leveled our rig back out and increased the bed to 5W space. The act of flipping RV axles widened the narrow space between the 5W and the top of the truck bed that made me awful nervous. It also got the 5W back to a level attitude when hitched up. 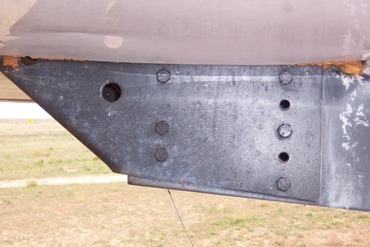 Just pulling out of a filling station or some other driveway was a nervous situation because the tail of the truck always went right up tight against the floor of the fifth wheel. That was one of the reasons I put the flatbed on the old '98. But, liking the way this new 3500 dually looks, I wanted to try and improve the way it goes together. So I decided to just do an RV axle flip. So just before we took off on the first long haul with the new tow vehicle, I had Jolley Rodger, up in Cheyenne, do the flipping rv axles dance. Now," flipping RV axles " doesn't mean you actually turn the axles over. What actually happens is the springs, which are normally mounted below the axles, are moved to a mounting position on top of the axles. In addition to doing the " flipping RV axles " thing on our fiver, I had to drop the pin box a couple holes as well. Not a real big deal, except that that thing is HEAVY! I used a saddle stand from my old shop to support the box under the ball socket as I worked it into the new position. Took just a few minutes. No big deal. On our rig we gained approximately 3 1/2 inches of increased space (between the truck bed and the 5W) when I lowered the pin box. Combined with flipping the RV axles, that also sets the rig pretty level when it's hitched up. It had been setting just a trifle high in front. One thing. It was a little too easy (In my opinion) to pop those pin box bolts loose. I hadn't ever checked them with a wrench. Big fault on my part! I would suggest, as a part of your regular maintenance schedule, that you check, with a torque wrench, the tightness of all your hitch bolts, every month or so, no matter what style of hitch you use. Having those suckers come loose on a rough road, on an otherwise glorious RV Boondocking trip would be a bad thing! ....... "Gee Martha, doesn't that look like our Fifth Wheel rolling across that cornfield all by itself?" That and the hitch is starting to look a little shabby isn't it? Soon as the weather permits I'm going to have to do a little painting to shine it up a mite. It takes a lot of weather out there in front like it is! We pulled a bit over 2,000 miles to Wisconsin and back, in hellatious wind, and some clankity bang rough roads. There was no handling change that I could detect, positive or negative, from the flipped axles. The only change was that I had a lot more leeway breaking over driveway aprons and such with the increased space. It cost a little over $300 for me to get the work done. They had to rework shock mounts and a couple other little things. So while I wouldn't consider it inexpensive, it sure beats the cost of getting a busted bed repaired! Keep the shiny side up, see ya RV Boondocking! Though it was mentioned to me that the 'shock mounts' had been fiddled with... I've come to realize that the 'fiddling' was only done on the lower end of the shocks. Recently, the lower nut, on the curb side, rear shock worked its way off, the shock came loose, bending the lower shaft of the shock absorber... forcing me to replace both shocks on the rear axle. It was during that shock absorber replacement that I discovered that a goodly amount of the shock travel was used up in compressing the shocks into the 'after market' position. 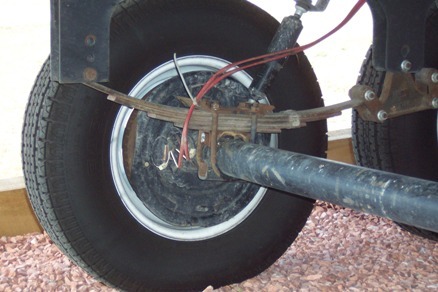 If you do an RV axle flip on your rig... make sure you look at how the shocks are going to be remounted and get those upper mounts tinkered with a bit if necessary. Otherwise... we've hauled many thousands of miles... including 6-8 thousand with a 500+lb V Star Motorcycle hangin' on the tail end with not one issue... just one busted shock absorber... and that 'cause a nut came loose.